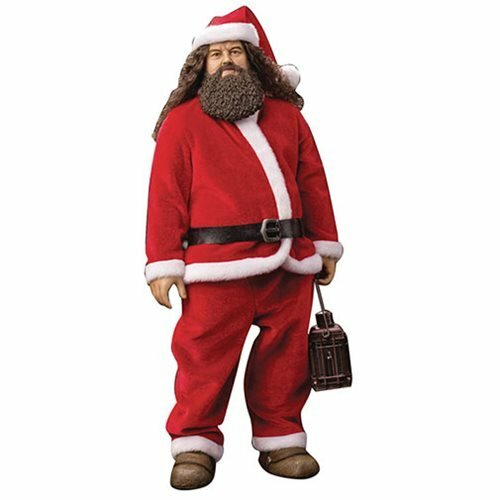 Rubeus Hagrid plays Santa in this 15 3/4-inch tall action figure! 26 points of articulation and an authentic likeness of actor Robbie Coltrane. The half-giant comes with his dog and a lantern. The Harry Potter Sorcerer's Stone Hagrid Special Version 1:6 Scale Action Figure features an a 15 3/4-inch tall body with over 26 points of articulation. The authentic likeness of Robbie Coltrane as Hagrid has rooted hair and a sculpted beard, and each sculpt is meticulously hand painted. 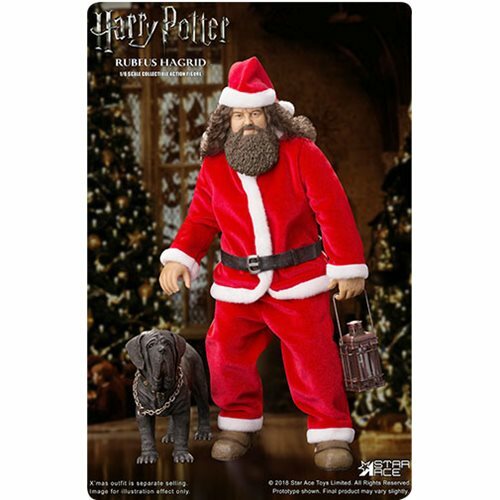 Hagrid comes in his Santa outfit with his dog and a lantern. One of the most beloved characters in the Harry Potter books and movies is the Hogwarts gamekeeper and half-giant, Rubeus Hagrid. He introduces young Harry to the wizarding world and is a constant friend and protector of the young trio of Harry, Ron, and Hermione.